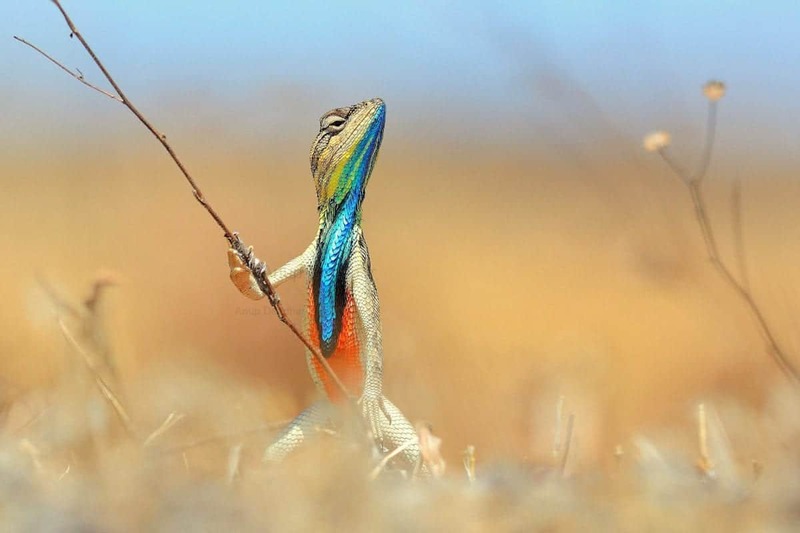 A lizard that looks as if it is playing air guitar and a stunning shot of as kestrel swallowing a vole are just two of the winners and runners up of an international photo competition. The pic of the fan throated lizard in full breeding colours came third in the Society of International Nature and Wildlife Photographers’ Nature’s Surprises competition. 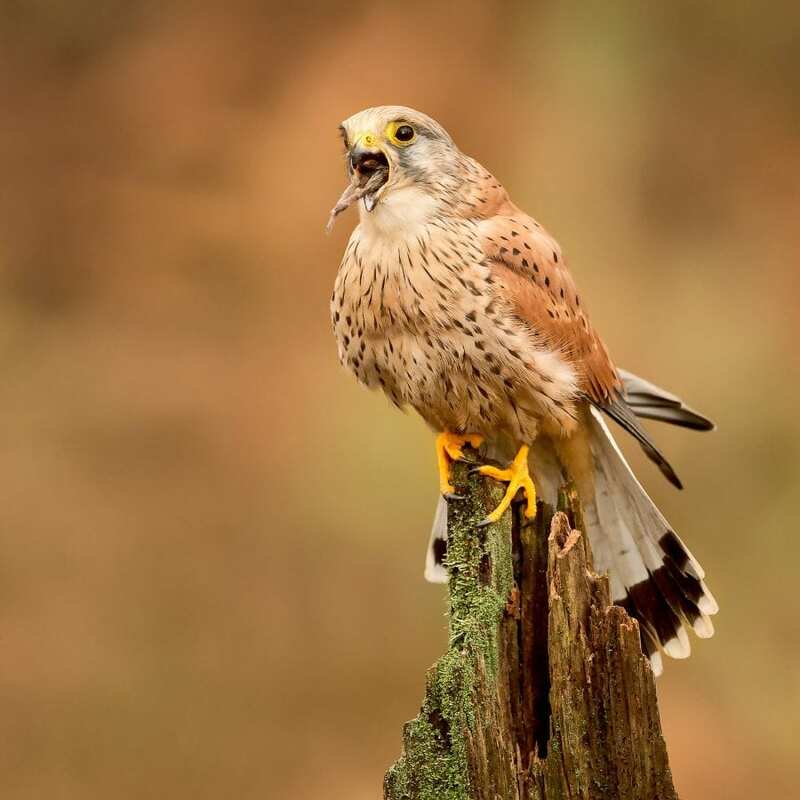 But beating off hundreds of entries to win it was British snapper Paul Smith with his picture of a kestrel swallowing a vole. Paul, from Hadleigh, in Suffolk said: “The image was taken in Tunstall Forest. “It was just before sunset when the Kestrel was sat on the old fence post with a vole. 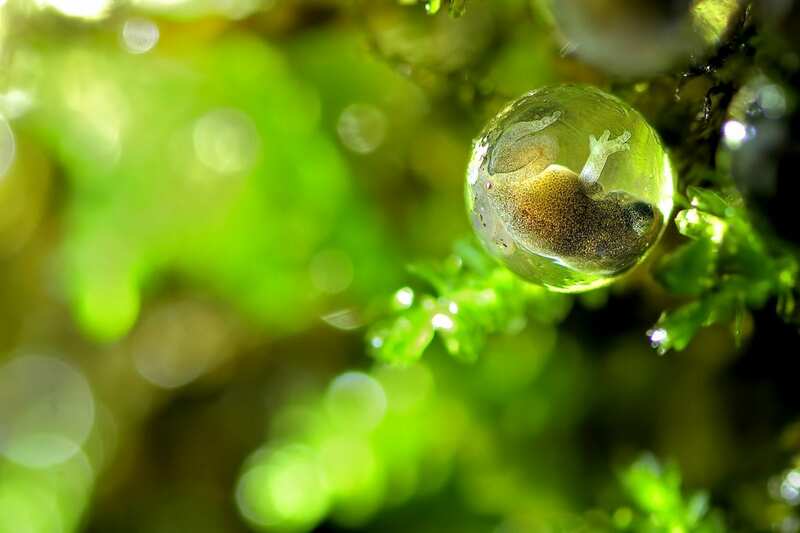 As well as bagging third place with his lizard picture Anup Deodhar, from India also got second place with a delicate snap of a frog still in its egg. He said of the lizard: “This is a Fan throated lizard male in breeding plumage. “In this image it can be seen that the lizard is standing taking support of the stick just to take a high point to scan his territory for any intrusion by other males. “These lizards are very aggressive and fights between males are frequent as they display their fan to attract females. Of his second placed picture, he added: “This is the egg of a Bombay bush frog where you can see a developed froglet about to pop out of the egg. 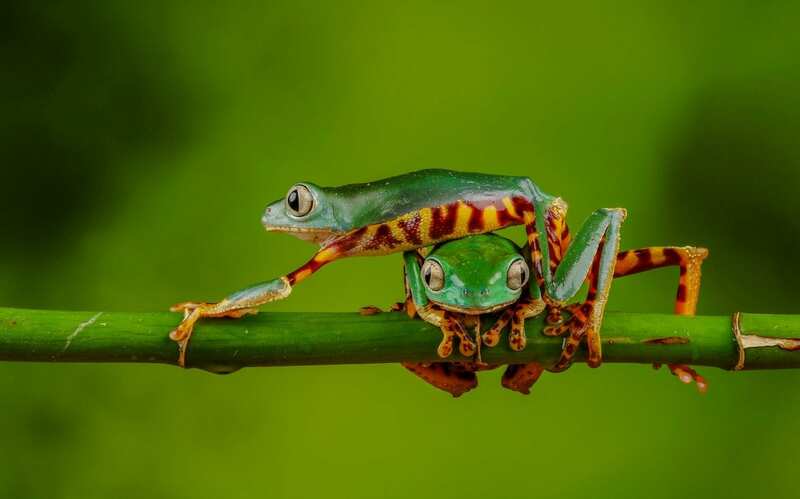 Highly commended was another Brit, tradesman Edward Payne, 26, who took this adorable shot of the strangely named Super Tiger Leg Waxy Monkey Tree Frog. He said: “I have spent a lot of time and effort with of frogs from all over the world to express their characteristics and personalities. Engineer Arghya Adhikary, 34 from Kolkata in India studied the Olive Ridley turtles for two years before getting his highly commended shot. 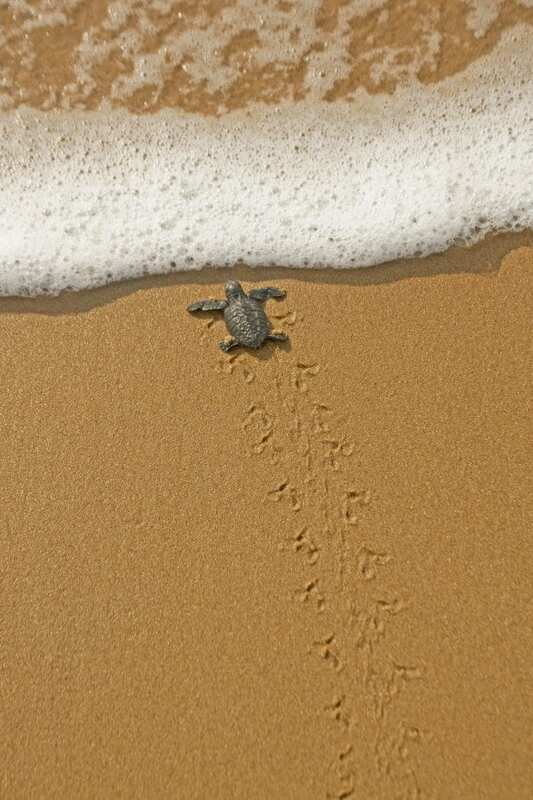 He said: “The picture was taken at Rushikulya rookery in Odisha, India and the hatchling is returning to the sea after being hatched on the seashore. “It took me a couple of years to study this amazing phenomenon from the mating to hatching of the vulnerable Olive Ridley turtles and the fact always stunned me the most that how could so tiny a new-born baby Olive Ridley make its journey to the ocean. 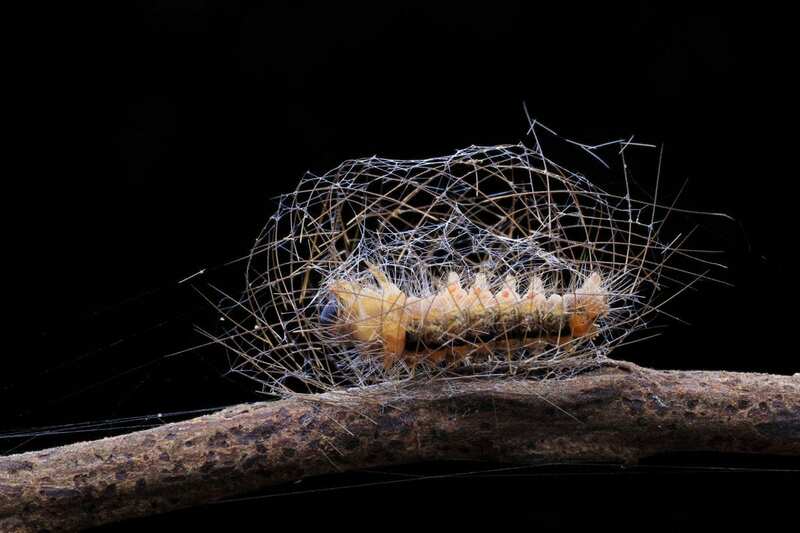 Yulianto Pongge, 24, a wedding photographer from Indonesia took this fascinating shot of a caterpillar weaving its cocoon. He said: “I took the photograph of the caterpillar because it is unique as I was seeing it for the first time. I thought it was a caterpillar process before it became a cocoon. Slightly less exotic but still stunning was this shot of bright blue damselflies on a hot day in London. 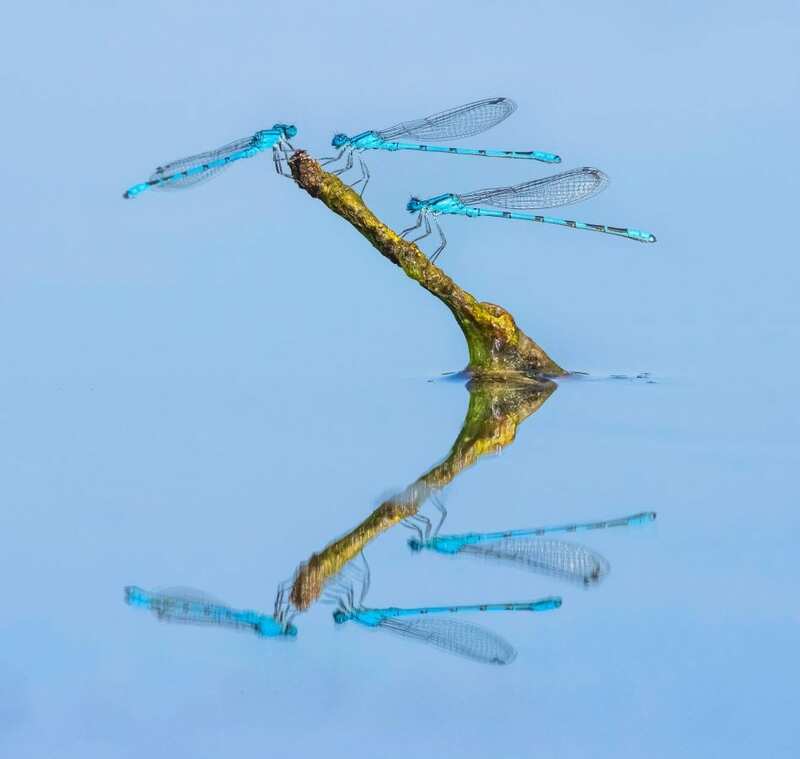 Amateur snapper Robert Page, 34, said: “These common blue damselflies were photographed in a park near my home in London. “It was a very hot day this summer when the damselflies were alighting on this perch to rest in between hunts across the surface of the pond. 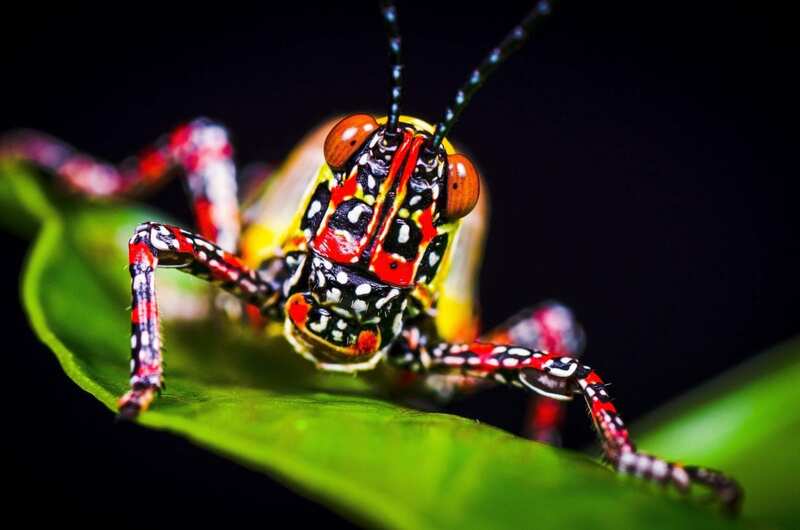 Another colourful insect was this highly commended painted grasshopper taken by 61 year old freelance photographer Ian Cook, from Northumberland. He said: “Known as the rainbow grasshopper, painted grasshopper, or the barber pole grasshopper, this is a species of grasshopper native to the United States, Canada and northern Mexico and exhibits warning colouration. 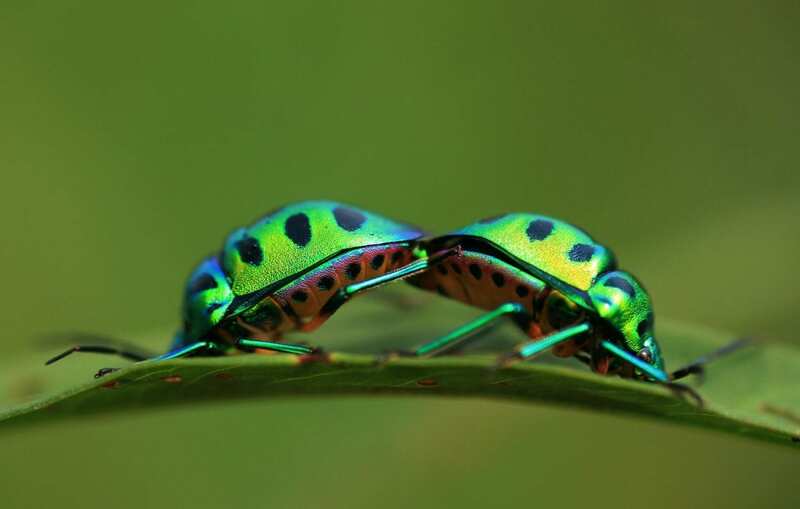 Another flash of colour came with this highly commended picture of a pair of jewel beetles by Sourav Mookherjee from India. 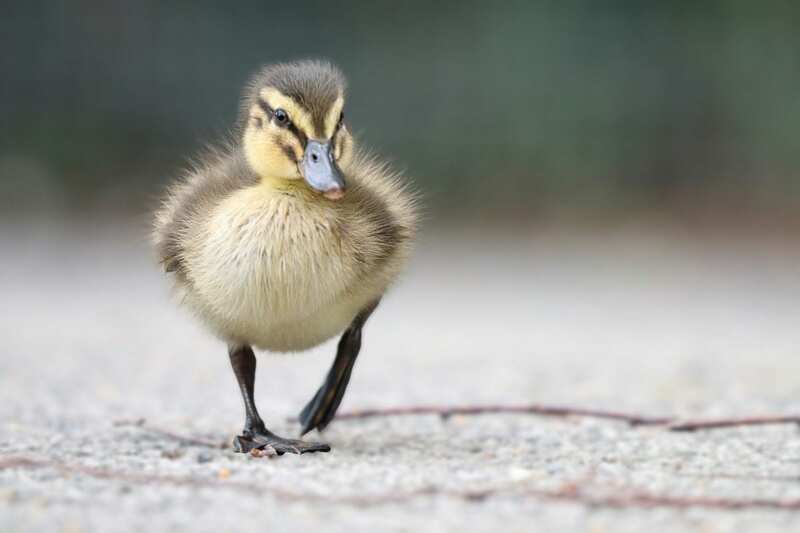 And last but not least is this fluffy duckling caught waddling along by amateur wildlife photographer Simon Marlow. The digital developer from near Reading said: “The image was taken during a trip I made to Martin Mere in Lancashire. “There were a number of mallard ducklings in a small pond with the parents. As I was walking away, I saw them start to come out of the water so I lay down on the ground. “They all came walking towards me so I was able to get some eye level images of these very cute ducklings.